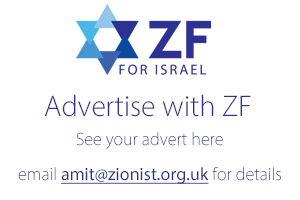 Founded in 1899, the Zionist Federation of the United Kingdom and Ireland (ZFUK) is the UK’s leading Israel advocacy and grassroots organisation. ZFUK celebrates Israel and challenges our enemies. With over 50,000 affiliates, ZFUK engages in advocacy training, mobilises activists across the UK, holds speaking events, demonstrations and rallies, as well as many educational seminars and events. ZFUK promotes the real face of Israel, including the contribution Israel has made to the world, in Medicine, in Agriculture, in Science, in Cultural industries and in innovation to name just a few. ZFUK is made up of over 30 constituent organisations with a range of political opinions and affiliations. ZFUK is an organisation where all of these views can come together and be part of the conversation. ZFUK values debate but believes that it is our commonality that unites us rather than our differences that divide us. ZFUK is the UK affiliate of the World Zionist Organisation. All constituent affiliates and individual members must agree to sign up to the Jerusalem Programme – The official platform of the World Zionist Organisation and the Zionist Movement.